The Esprit was always destined to receive the multi cylinder engine it deserved. Even when the original S1 Esprit was launched it's stretched Lotus Europa chassis and engine compartment were roomy enough to accomodate more than the then new Lotus 907 straight 4 (click here for more on the development of the Esprit. 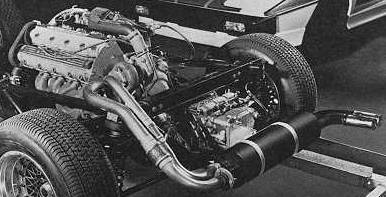 Both the original 160 bhp 907 engine, which entered production in the S1 Esprit in 1976, and turbocharged 210 bhp 910 engine, which first appeared in the Essex Esprit Turbo in 1980, were canted at a 45 degress to the left, leaving a space to the right which could be utilised by another bank of cyliners.